If you repeatedly perform overhead throws at high speeds, it can put tremendous pressure on your elbow. In addition, tight forearm muscles compound the stress on your elbow because your elbow has to compensate for a restricted range of motion. 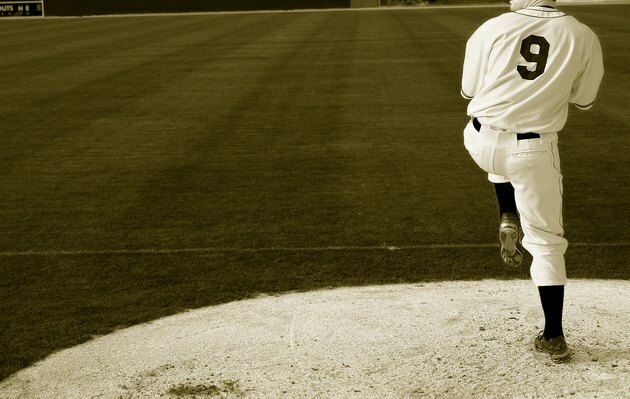 Various problems, such as overuse, overload, muscle tightness and poor throwing form, can lead to the inflammation of the tendons around your throwing elbow, causing the pain in your forearm. The rapid wrist snap in an overhead pitch requires resisted wrist flexion and the pronation -- the movement from a palm-up to palm-down position -- of your forearm. Overusing the tendons around the medial or inner side of your elbow, which generates the wrist snap, can lead to inflammation and tendonitis. Known as golfer’s elbow, medial epicondylitis is the degeneration of your arm’s flexor tendon resulting from the overuse of excessive force on a wrist snap. If you’re feeling pain on the inside of your forearm and it extends from your elbow to your pinky finger, it is recommended that you ask your doctor to look at the injury for flexor tendon damage, according to New York-Presbyterian Hospital. When you bend your elbow, the ulnar nerve stretches around the bump at the end of your upper-arm bone, or humerus. Every time you pitch a baseball, that nerve has to stretch. Overuse can lead to a condition known as ulnar neuritis, or an irritated nerve. You’ll feel a tingling pain that begins at your elbow and travels into your forearm. Other symptoms include a tingling or numbness in your ring and pinky fingers during or after a pitch. Overuse can even cause the ulnar nerve to slide out of place and snap. This condition is often associated with medial epicondylitis, according to “Magnetic Resonance Imaging in Orthopaedics and Sports Medicine” by David Stoller. Elbow injuries and forearm pain have a strong correlation to the number of pitches you throw, innings you pitch and months you play. In addition, the more force you use on a pitch, the more vulnerable you are to these injuries. If you’re bending your arm too early or too late in the throw, it can put excessive stress on your elbow and forearm. An example of improper form is leading with your elbow and pushing the ball with your forearm instead of using your shoulder to execute a pitch. Adjusting your warm-up routine can help to reduce your risk of injury. As opposed to a hand grip that only works your wrist, use rubber tubing to warm and stretch both your wrist and forearm. If you’re feeling forearm pain after throwing a baseball, the first step is to stop throwing and rest your throwing arm. Apply ice and elevate your arm if you’re experiencing any swelling or inflammation. Visit your doctor to figure out the source of the pain. He or she may prescribe anti-inflammatory medications to alleviate the pain. Have your coach evaluate your throwing form and correct any flaws contributing to stress on your elbow. While your arm recovers, you may have to limit your throwing and do cardiovascular work to maintain physical conditioning. Why Does Your Elbow Hurt After Throwing a Softball?